We're sorry, reservation times are not available online for a party of this size on the selected day. Please call us at 802-864-9800 and we will see if we can accommodate your party. For parties greater than 4, please contact us at 802-864-9800 for assistance with your reservation. Please be sure to include your Guest Type (required by Sweetwaters). Newsletter: By selecting any of the following options, you agree to receive communications from Sweetwaters. We do not share your information with any 3rd parties. You can withdraw your consent at any time. Stay personally connected to Sweetwaters with your free preferences profile. You'll have convenient access to Sweetwaters's news, promos and special events! And Sweetwaters can get to know you better with automated communication. Our seperate and open second-level dinning room is available for large parties up to 60 guests. Please contact us for more detailed information about booking a large party event. Sweetwaters has been Burlington's classic gathering spot for over 30 years. Located at the corner of Church and College Streets on the Church Street Marketplace downtown. We are proud to serve up award-winning bistro fare; including lunch, dinner and late night. Please note that our outside patio tables are first come, first serve and not available for reservations. 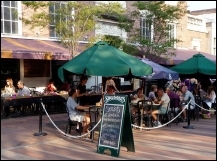 A dining experience at Sweetwaters also includes the "best people watching" in the city, an extensive bar selection and Church Street Patio Seating. For more information contact DAVID MELINCOFF at contact@sweetwatersvt.com or visit our Group Dining section. Located in the heart of Burlington at the corner of College and Church Sts.